Note, the fabrics for the top of this quilt were given to me as part of the Island Batik ambassador program. 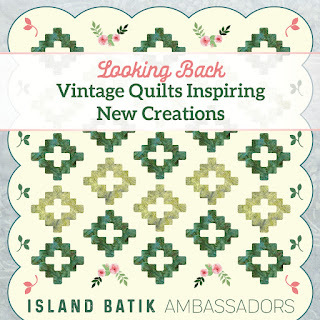 As I mentioned in a previous post, the April challenge for the Island Batik ambassadors is Looking Back: Vintage Quilts Inspiring New Creations. And here's my quilt, squeaking in just before the end of the month 😊 I've actually had the quilt finished for ages, but available time+available quilt holders+decent weather proved a difficult combination to achieve. 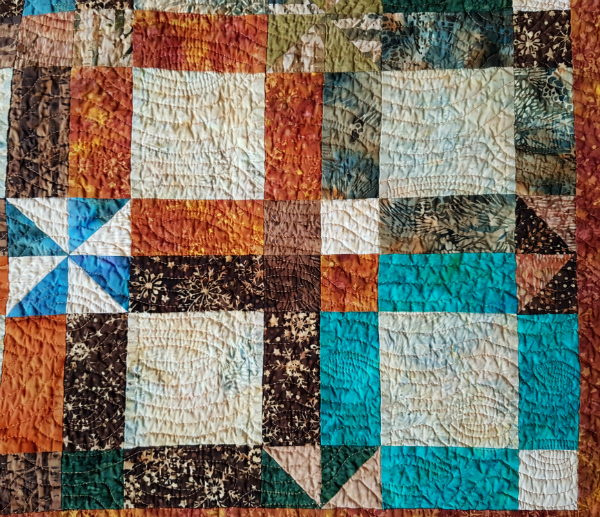 I didn't use any one particular traditional quilt as my inspiration, but rather three traditional blocks - the pinwheel, four patch and signature blocks (though I didn't use the spaces for signatures). 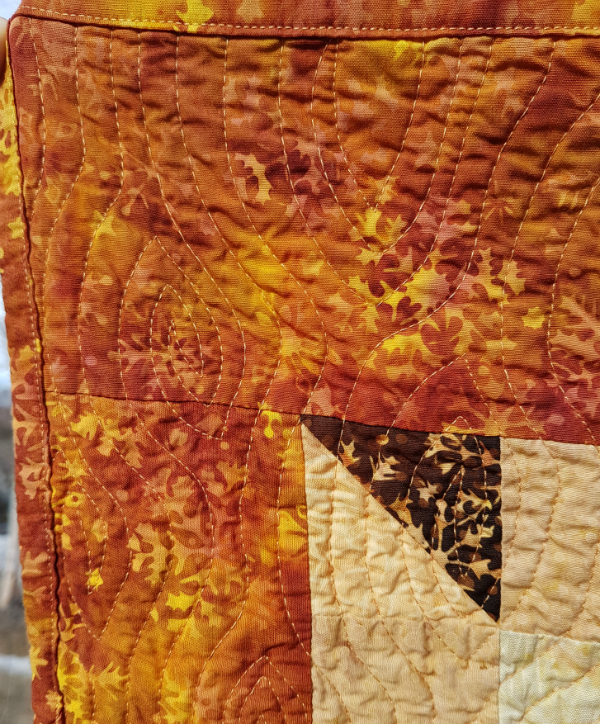 I used Island Batik's Northern Woods line for this quilt. I love the fun pops of teal with the oranges, browns and creams. I also love the forest inspired prints. There are tree trunks, grasses and pinecones, along with mottled prints. 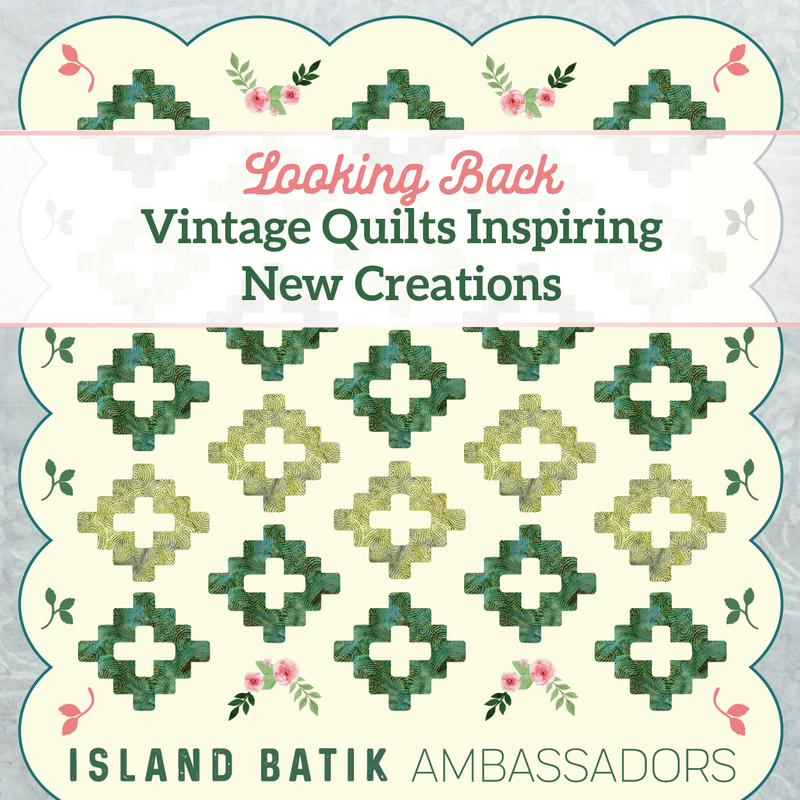 Island Batik sent me a 10" square bundle of the line, all of which I used for the blocks. They also sent yardage of two of the prints (a light and a dark), which I used for the center squares, the borders and the binding. 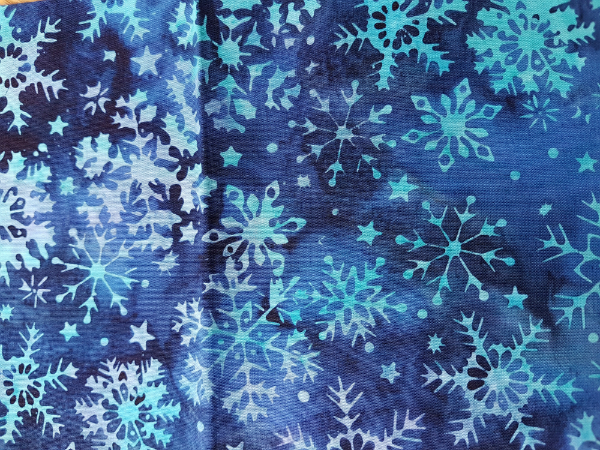 I think this snowflake print is my favourite. I wish I could have yardage of it in a whole range of colours! 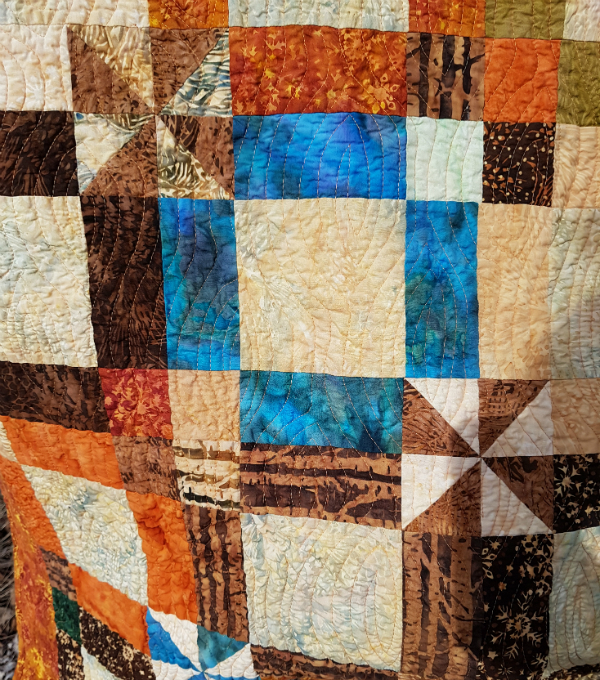 I used Aurifil 2210 (Caramel) to quilt a wood grain design, which certainly fit with the fabrics. I used Hobb's 80/20 batting, which was also given to me as part of the Island Batik ambassador program. This pattern is currently with testers and I'm anxious to see their versions. It's always so much fun to see my patterns in fabrics chosen by other quilters. I know one of the testers is using solids, which will give it a completely different look. I do need a little help though. I can't decide what to name this quilt. I've been calling it Northern Woods, just because that's the name of the fabric line, but that doesn't fit the pattern at all. I'd love to have some suggestions! What would you call it? Thank you to Island Batik for the beautiful fabrics and for the challenge to create something along a given theme each month 😊 I'm having fun as an ambassador! 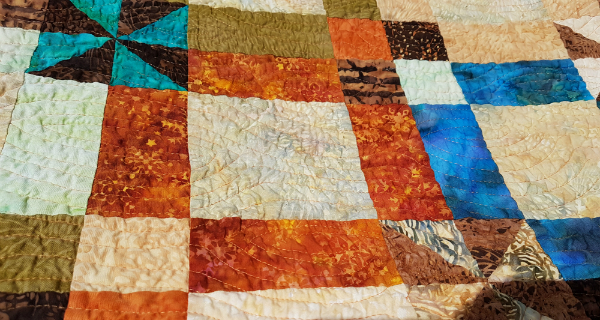 You did a great job, Leanne, and your quilting is perfect! Pretty quilt and nice quilting. I would call this "Spin Around the Block". 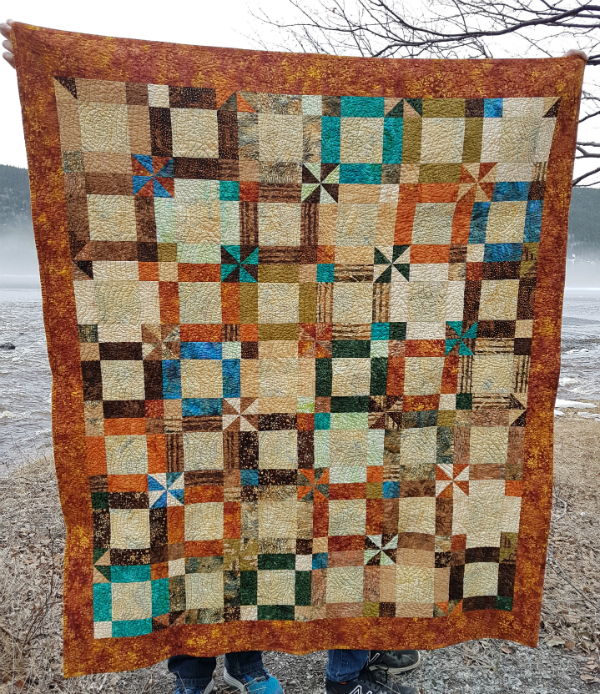 :) It's a lovely finish, and the woodgrain quilting is perfect for it! Looks great. I also love the teal. What about Square with a Twist? Or Twisted Squares. That snowflake print is amazing. Not that I want snowflakes coming to visit LOL Great job on that woodgrain quilting. Lovely quilt Leanne, I like Yvonne's suggestion for the name too! This is lovely! I loved working with this line last year and you're definitely right about the snowflake prints -- they are beautiful! I think Northern Woods fits great as a quilt name. Trees, leaves, lakes--all the colors are there. Lovely finish!